Stephen Waarts is a recent graduate of the Curtis Institute of Music in Philadelphia, where he studied with Aaron Rosand, following earlier studies with Itzhak Perlman. He is currently at the Kronberg Academy studying with Mihaela Martin. He has been a prizewinner at several competitions; e.g. Queen Elisabeth, Montreal and Menuhin, among others. 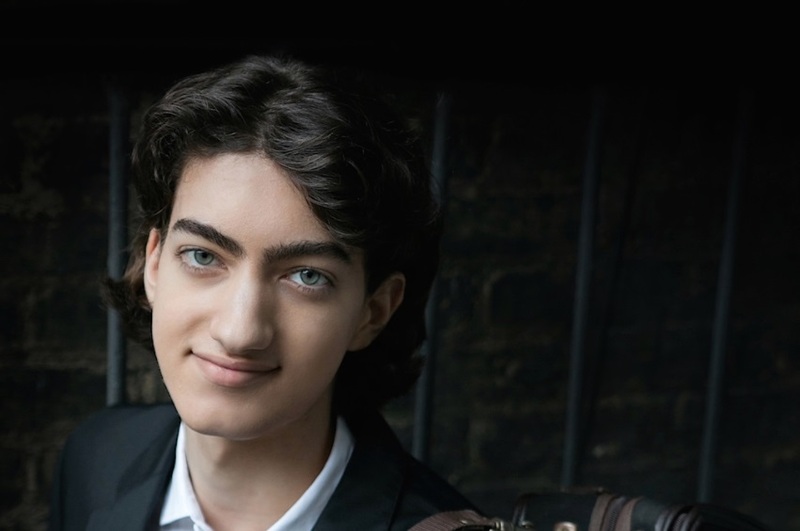 He won a Young Concert Artists Audition in 2013 at the age of 17 and as a young artist from the YCA roster, he was presented Feb. 28 by the Chamber Music Society of Palm Beach at the Rosarian Academy, located across the Intracoastal on Flagler Drive. The Rosarian Academy auditorium has favorable acoustics for chamber music, nicely supporting Waarts and pianist Chelsea Wang in their program, which opened with Mozart’s Sonata in E minor, K.304. A work tinged with sadness, it was written in Paris, where the composer had journeyed in hopes of securing employment, in which effort he was unsuccessful. Compounding his lack of success was the death of his mother, who had accompanied him on his travels, on July 3, 1778, and who is buried in Paris. The sonata, the twenty-first of the violin sonatas, is in the unusual key of E minor, the only one of his instrumental works in that key. Both movements are in the tonic minor. The Allegro hews to the older style of piano sonata with violin accompaniment and has a second subject in the major. The Tempo di minuetto has a plaintive arioso very much in operatic style, which is interrupted by a homophonic middle section in the major. The performance had exceptional intimacy, with both violin and piano very much equal voices when called for. At 20, Waarts, rail-thin, with wavy dark hair and sloe eyes, played with a beautifully focused sound that nourished lyrical elements, and which was well-balanced from low to high registers. The harmonics in “Cançión” were deliciously smooth and leggiero. “Nana” is mostly muted, and his articulation con sordino was rather smeared, but improved in the unmuted passages. “Polo” is often played over-vehemently, but if Waarts was occasionally guilty of it, his impeccable taste kept excess in check. A pleasant surprise was the lack of an intermission, which meant that the Falla was followed by the Sonata in A (Op. 100) by Brahms. It is the sunniest of his three violin sonatas, and is sometimes nicknamed “Thun,” after the village in the Swiss Alps where he spent the summer of 1886. The first three notes of the opening Allegro amabile are the same as those of the “Prize Song” in Wagner’s Die Meistersinger von Nürnberg, but whether a conscious quotation is debatable. A number of Brahms’s songs from the same time hover around the movement as well. “Auf den Kirchhofe,” (Op. 105 No. 4), for example, is heard in the Allegretto grazioso finale. Brahms called the work Sonata for Piano and Violin, which in his usage meant that both instruments were equal partners. Waarts seemed to revel in its flood of lyricism, but his partner, Wang, was inclined toward stolidity instead of ardor, which resulted in a lower-temperature-than-ideal performance. Another problem was that the piano’s tuning was very unhappy with the key of A major. Happily, the D minor tonality of Stravinsky’s Divertimento, arranged with Samuel Dushkin, from his ballet Le baiser de la fée, revealed no tuning problems. Pianist Wang was quite successful in handling Stravinsky’s spiky rhythms and strong accents, and the performance offered a brilliant conclusion.